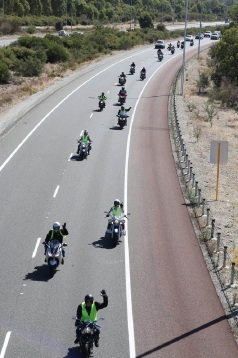 The event attracted 200 riders for the trip from Baldivis to Dwellingup. The ride started from Masters Baldivis, where participants enjoyed a bacon and egg roll, before a leisurely ride through the back roads south of Rockingham and then heading up the Darling Scarp to Dwellingup. Dwellingup Primary School staff joined forces with the RSL and the P&C to prepare lunch for the riders and their passengers. The aim of the ride was to raise awareness of depression and suicide prevention and raise funds for local mental health services. Anyone suffering from depression, or knows of anyone suffering depression, can call Lifeline on 13 11 14. Lifeline was one of the main beneficiaries of the Black Dog Ride.